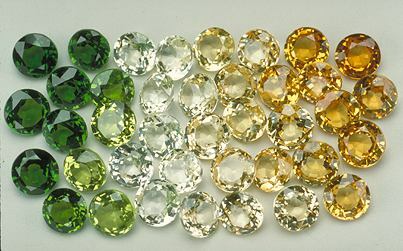 Most people think of garnet as red, but in fact garnets occur in every color, including green (tsavorite) and orange (spessartite). But some garnet colors are extremely rare, particularly blue and white (colorless). The blue color of garnet is occasionally found in the rare color change garnet from Madagascar and Kenya. Some of these gems display a greenish-blue under daylight and a deep purple under incandescent light. But while the blue is very rare, the white garnet is even rarer. Colorless garnet is known as leuco, and it is a type of grossular garnet. The grossular family also includeds the chrome green tsavorite and cinammon-colored hessonite. 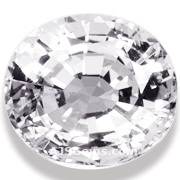 Grossular is a calcium-aluminum garnet with a hardness of 6.5 to 7.5 on the Mohs scale. It has a high refractive index (1.734-1.759) and thus excellent brilliance. Most specimens of leuco garnet are not completely colorless. Most have a strong tinge of yellow or green. They also tend to be heavily included. The rare leuco garnet from Burma shown above is perfectly transparent with only a few small inclusions that can be seen under magnification. It is almost perfectly colorless with just the slightest tinge of pink. Leuco garnet has been found in Canada, Mexico and Tanzania as well as Burma. It is mainly a collector's gem, due to its extreme rarity, and prices for high quality stones reflect this.